US, 2009, 86 minutes, Colour. Carter Jenkins, Austin Butler, Ashley Tisdale, Ashley Boettcher, Henri Young, Regan Young, Doris Roberts, Robert Hoffman, Kevin Nealon, Gillian Vigman, Andy Richter, Tim Meadows. Believe it or not, it is coming close to 30 years since ET was made. Here is a small, low-budget variation on the theme, designed for family audiences and for children who have not become too caught up in Transformers-like holiday shows. After spending perhaps too much time establishing the Pearson family, with 15 year old Tom being bullied for beccaue he is intelligent and his trying to show that he is not, and 17 year old Bethany doting on dumb hunk, Rick, we go off on a fishing holiday with them where they are joined by their uncle and cousins who tend to dominate. So, the scene is set. Noises upstairs reveal four aliens (tiny in size but large in aggressive attitudes, except for a cute little fellow who is the brains of the group). 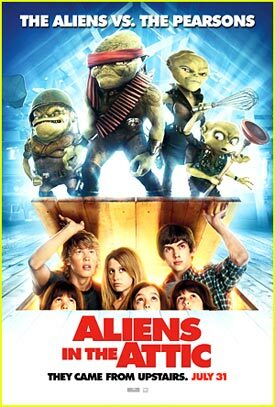 Plenty of comedy and slapstick as the kids pursue the aliens and the aliens attack the kids. The aliens can't take possession of kids but can robotise adults with a machine (which the kids find and use to their advantage, especially robotising Rick). The kids keep this all a secret from their parents and have to devise different ways of covering up, especially with the local sheriff intervening. Nothing particularly startling but it is an undemanding holiday show that should keep undiscriminating children amused for an hour and a half. Parents who liked the TV series, Everybody Loves Raymond, should pop in later in the film to see Doris Roberts (Raymond's mother) play grandmother who is taken over and is able to do all kinds of martial arts techniques, leaps and kicks, in battling Rick. Robert Hoffman deserves an acknowledgement for his being a good sport in portraying Rick as a loathsome two-timing jock and allowing himself to spend a lot of time as absolutely inane because the kids have robotised him! 1.A film for family audiences? Young children? Families, aliens, adventures? 2.The plausibility of the plot? The aliens in the attic, their invasion, the preparation for taking over the world? Their ineptitude? The confrontation with the children? Taking possession of the adults? The happy resolution? 3.The voices of the aliens, Thomas Haden Church, Josh Peck, J.K. Simmons? The special effects, the appearances? Small? The commander? Sparks? The male and female? The flying saucers? 4.The introduction to the Pearson family, Tom, his age, clever, changing the report marks on the computer, his being bullied because he was clever? His father’s attitude? His mother’s care? Bethany, her age, going out with Ricky? Hannah and her being very young? Shrewd? The parents? Going away for the holiday, the trip, arriving at the house? The reluctance of the children? The prospect of fishing? 5.The arrival of Uncle Nathan, of Jake, the twins? The different attitude? Jake taking over, bullying Tom? The rooms, the parents? 6.Hearing the noises, the aliens? The character of the aliens? Their wanting to take over the world – the background of what happened on their planet? The commander and his ugliness, attack? The two agents and their squabbling, attraction? Sparks and his being sympathetic, sympathetic to the humans? 7.Taking over the adults? Ricky and his relationship with Bethany, his coming to the house, pretending the car had broken down, getting on the good side of the parents? His being taken over – and his having to act like a fool? The build-up to the clash with Bethany, to the fight with the grandmother? 8.The grandmother, her love for the grandchildren, watching the TV?